The territory includes 155.4 km2 (60.0 sq mi) Ashmore Reef (including West, Middle, and East Islands, and two lagoons within the reef) and 44 km2 (17 sq mi) Cartier Reef (including Cartier Island). They have a total of 74.1 km (46 mi) of shoreline, measured along the outer edge of the reef. There are no ports or harbours, only offshore anchorage. West, Middle, and East Islands have a combined land area variously reported as 54 ha, 93 ha, and 112 ha (1 hectare is 0.01 km2, or about 2.5 acres). Cartier Island is an unvegetated sand island, with a reported land area of 0.4 ha. Ashmore Reef is called Pulau Pasir by Indonesians. In the Rote Island language, it is called Nusa Solokaek. Both names have the meaning "Sand Island". Nearby Hibernia Reef, 42 km (26 mi) northeast of Ashmore Reef, is not part of the territory, but rather belongs to Western Australia. It has no permanently dry land area, although large parts of the reef become exposed during low tide. The territory is administered from Canberra by the Department of Regional Australia, Local Government, Arts and Sport, which is also responsible for the administration of the territories of Christmas Island, Cocos (Keeling) Islands, the Coral Sea Islands, Jervis Bay Territory and Norfolk Island. As part of the Machinery of Government Changes following the 2010 Federal Election, administrative responsibility for Territories was transferred from the Attorney General's Department to the Department of Regional Australia, Local Government, Arts and Sport. Defence of Ashmore and Cartier Islands is the responsibility of Australia, with periodic visits by the Royal Australian Navy, Royal Australian Air Force and Australian Customs and Border Protection Service. The vessel ACV Ashmore Guardian is stationed more-or-less permanently off the reef. The islands are also visited by seasonal caretakers and occasional scientific researchers. On 21 October 2002 the nature reserve was recognised as a wetland of international importance when it was designated Ramsar Site 1220 under the Ramsar Convention on Wetlands. Due to its proximity to Indonesia, and the area being traditional fishing grounds of Indonesian fishermen for centuries, some Indonesian groups claims Ashmore Reef to be part of Rote Ndao Regency of East Nusa Tenggara province. However, the Indonesian government does not appear to actively contest Australia's possession of the territory. Australia's sovereignty is backed up by the fact that the territory was not administered by the Netherlands (Indonesia's former colonial power), but by the British before it was transferred to Australia. A memorandum of understanding between the Australian and Indonesian governments allows Indonesian fishermen access to their traditional fishing grounds within the region without any formal visa arrangements, subject to limits. 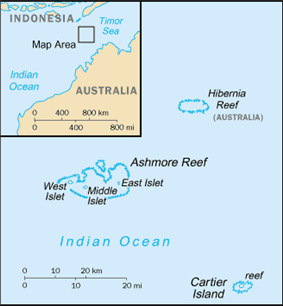 The Ashmore Reef Commonwealth Marine Reserve (formerly Ashmore Reef National Nature Reserve), established in August 1983, comprises an area of approximately 583 km2 (225 sq mi). It is of significant biodiversity value as it is in the flow of the Indonesian Throughflow ocean current from the Pacific Ocean through Maritime Southeast Asia to the Indian Ocean. It is also in a surface current west from the Arafura Sea and Timor Sea. The Reserve comprises several marine habitats, including seagrass meadows, intertidal sand flats, coral reef flats, and lagoons, and supports an important and diverse range of species, including 14 species of sea snakes, a population of dugong that may be genetically distinct, a diverse marine invertebrate fauna, and many endemic species, especially of sea snakes and molluscs. There are feeding and nesting sites for loggerhead, hawksbill and green turtles. It is classified as an Important Bird Area and has 50,000 breeding pairs of various kinds of seabirds. A high abundance and diversity of sea cucumbers, over-exploited on other reefs in the region, is present, with 45 species recorded. The Cartier Island Commonwealth Marine Reserve (formerly Cartier Island Marine Reserve), established in June 2000, comprises an area of approximately 172 km2 (66 sq mi), within a 4 nautical mile radius from the center of Cartier Island, and extends to a depth of 1 km (0.6 mi) below the sea floor. 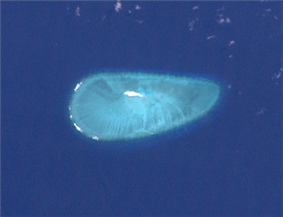 It includes the reef around Cartier island, a small submerged pinaccle called Wave Governor Bank, and two shallow pools to the island's northeast. There is no economic activity in the Territory. As Ashmore Reef is the closest point of Australian territory to Indonesia, it was a popular target for people smugglers transporting asylum seekers to Australia despite its only wells being infected with cholera or contaminated and undrinkable. Once they had landed on Ashmore, asylum seekers could claim to have entered Australian territory and request to be processed as refugees. The use of Ashmore for this purpose created great notoriety during late 2001, when refugee arrivals became a major political issue in Australia. As Australia was not the country of first asylum for these "boat people", the Australian Government did not consider that it had a responsibility to accept them. A number of things were done to discourage the practice such as attempting to have the people smugglers arrested in Indonesia; the so-called Pacific Solution of processing them in third countries; the boarding and forced turnaround of the boats by Australian military forces, and finally excising Ashmore and many other small islands from the Australian migration zone. Two boatloads of asylum seekers were each detained for several days in the lagoon at Ashmore after failed attempts by the Royal Australian Navy to turn them back to Indonesia in October 2001. ^ a b Annotated Ramsar List.